Creating Communities: Quantity vs. Intensity? It’s fascinating to watch how different companies attempt to harness social media to create what Seth Godin describes as tribes. Clearly there are many benefits to organisations creating online communities and engaging with their customers and potential customers via social media sites such as Facebook and Twitter – the most obvious being that communication is interactive, direct and instant. One school of thought says its best to amass huge tribes (some companies by virtue of their brand power are able to do this anyway). Coca Cola’s Facebook Page for example, has some 3,773, 653 fans. But does size really matter, or is it more important to have a small, but highly interactive tribe? Blue Dog Photography is one example of a small company who has created an engaged tribe. This photography training company is run by commercial photographers Danielle and Nick Lancaster out of Tamborine Mountain, in Australia’s Gold Coast Hinterland. Their Facebook Group page is relatively new and small – about 250 members. I joined the group after attending some Blue Dog workshops this year. Blue Dog engages with its workshop participants by offering a weekly photo competition. Open only to people who have attended a workshop, this competition instantly creates a feeling of exclusivity. Participants are asked to list the camera settings of the shots they submit, which promotes ongoing learning and information sharing. 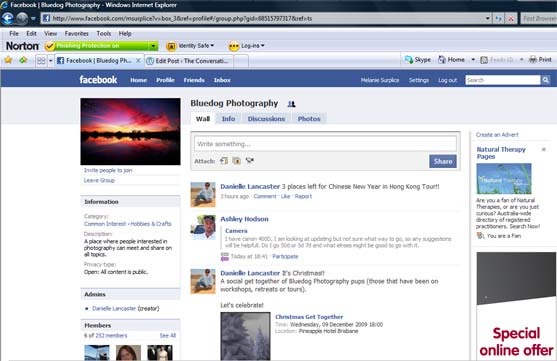 Members are invited to comment on each other’s photos, which promotes much discussion amongst the group, and is leading to the formation of many new Facebook friendships. Blue Dog lists details of upcoming workshops and retreats so that group members are always aware of when the next event is on – but it never feels like a sales pitch. You can practically hear the cheers from the community each time new workshops dates are announced. More recently, Blue Dog started posting daily updates from its photography tours on Fraser Island and Vanuatu. What better PR than to have happy customers posting amazing pictures to their Facebook and Flikr profiles, and the photo album on the Blue Dog page. From a customer perspective, the regular interaction between the Lancaster’s and their “customers” (who they more frequently refer to as friends), is really valued. They converse online with the same friendly, professional approach they adopt in their workshops, so the “Blue Dog experience” is consistent wherever the interaction takes place. Blue Dog uses Facebook to provide advice and commentary on people’s images, regular tips about photography via the Blue Dog blog, links to photographic exhibitions, and information that is generally useful to their growing base of fans. From a marketing perspective, it’s a positive example of how a relatively small business can engage instantly, regularly and cost effectively, with its clients and prospective clients. Importantly, it demonstrates that tribes don’t have to be huge to be effective. In the case of Blue Dog Photography’s tribe, intensity is definitely winning out over quantity. Melanie Surplice has more than 12 years of experience in international BtoB marketing communications and is a former public relations professional. She is a part time Report Writer in the Dow Jones Media Lab based in Australia. 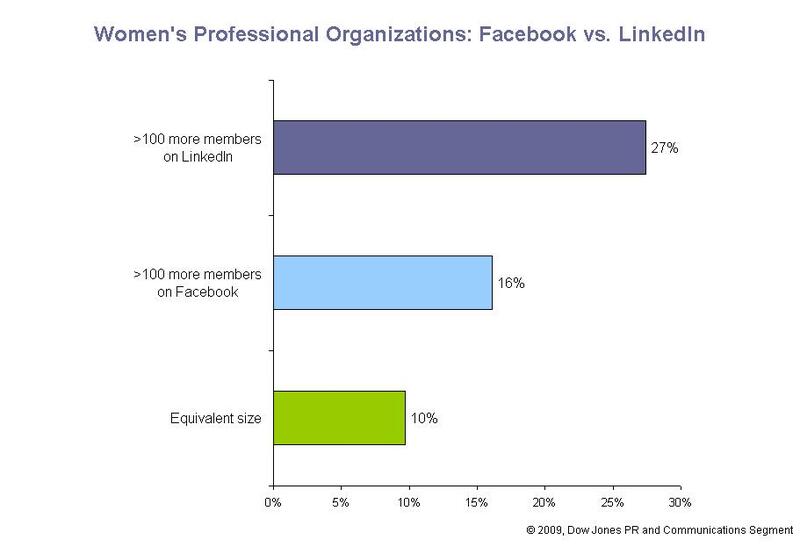 This made me think: Are women’s business organizations missing an opportunity to connect online? Facebook touts more than 300 million active users, with 50% logging on in any given day. Among US users, women outnumber men in every age group. The gap is most notable in age groups that correspond with prime career years: 26-34, 35-44, and 45-54. Women outnumber men by more than 2 million in each of these groups. In the US alone, that’s nearly 7 million more women than men potentially in the prime of their careers. So why wouldn’t professional organizations want to reach women through this channel? 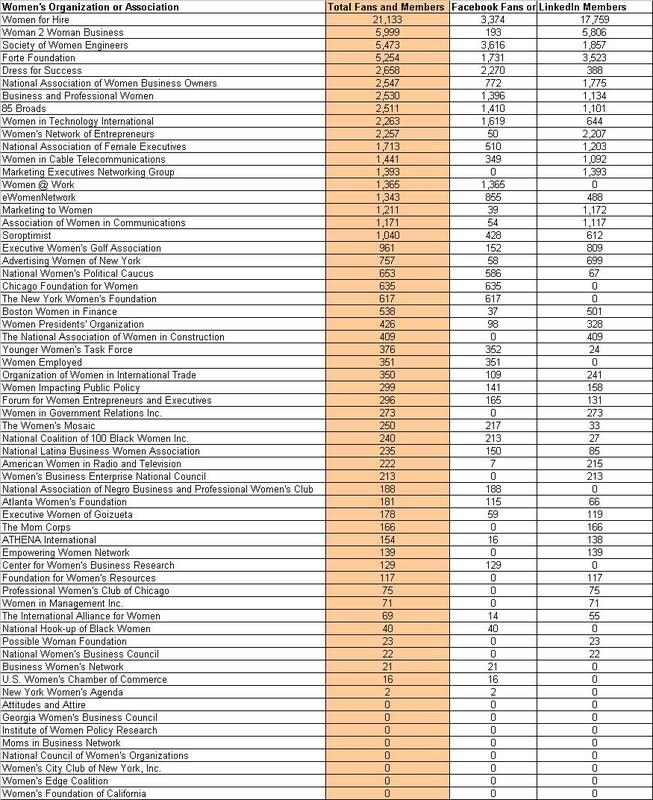 Using MainStreet.com’s Top Women’s Organizations and PINK Magazine’s Favorite Women’s Business Organizations, plus a smattering of personal favorites like 85 Broads, I compared 62 women’s organizations and their presence on Facebook with LinkedIn, the traditional source for online business networking. Encouragingly, more than three-quarters of organizations researched have some social media presence, and a slight majority maintains a presence on both Facebook and LinkedIn. There doesn’t seem to be any theme about what “types” of organizations fall into each category – nationals vs. regionals, for example. The only potential stand out is with ethnic women’s organizations. Of the four included, none fell into the “LinkedIn only” category. For organizations with a presence on both channels, there appears to be a positive correlation on group size: the bigger the Facebook group, the bigger the LinkedIn group, and vice versa. So it would seem members aren’t flocking to one channel over the other. LinkedIn groups are usually better populated than Facebook groups at present – this could be accounted for by the fact that LinkedIn is a bit longer in the tooth. 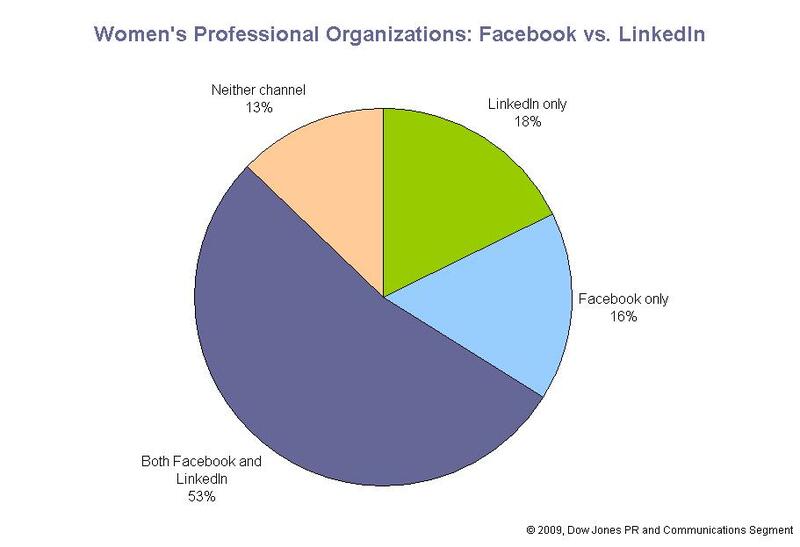 So what does all this mean for women’s professional organizations, and the use of channels like Facebook for business networking? First, you can successfully promote and recruit members through more informal networks, but you shouldn’t pick one over the other. A good social media strategy combines interesting content and awareness efforts across multiple channels. Click here to see the full list of organizations we reviewed and which seem to be following this best practice. Jennifer Hoffmann is Manager of Customer Engagement at Dow Jones and is based in New York City.